Pictured L-R: Derek Snyder, GC Pro Regional Manager; and 424 POST principals and co-founders Kami Asgar and Sean McCormack. Asgar and McCormack have been relying on GC Pro for gear and unparalleled service since their company's inception. WESTLAKE VILLAGE, CA, August 30, 2012 — Academy Award-nominated 424 POST is an all-digital post-production sound facility based in Culver City, California, committed to meeting the needs of the entire range of postproduction sound projects, from sound design to editorial, for both big-studio projects and independent features. Most recently, 424 POST handled the sound for big-screen dance-musical feature Perfect Pitch and for Dwayne Johnson’s forthcoming action thriller Snitch, a pair of films that bookend the wide variety of audio necessary in Hollywood feature work, from full-range music scores to high-SPL action sound effects. 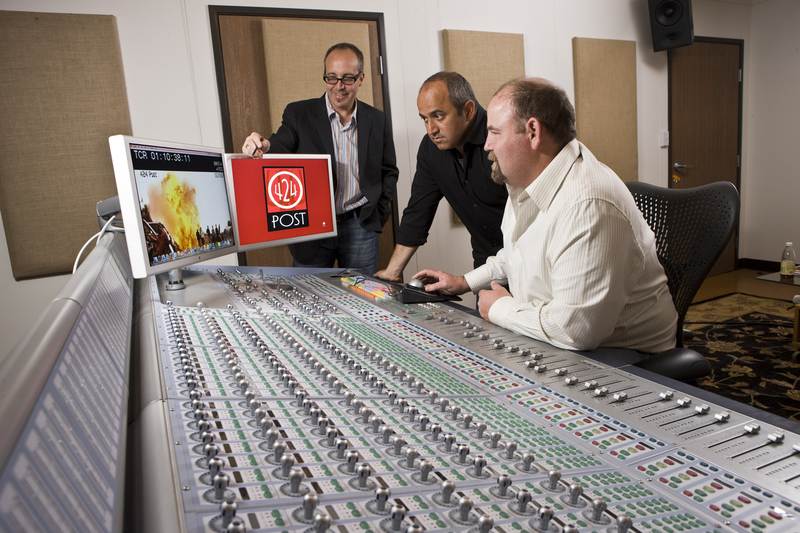 424 POST, which celebrated its tenth anniversary this year, handles all of it effortlessly, thanks in part to a new Meyer monitoring system sourced through Guitar Center Professional (GC Pro), the outside sales division of Guitar Center that focuses on the needs of professional users, with whom 424 POST has a long-standing and successful relationship. In addition, the new Meyer Acheron 80 Screen Channel loudspeaker system that is now the centerpiece of 424 POST’s newest sound mixing stage was installed by Horacio Malvicino of the Malvicino Design Group, one of GC Pro’s approved vendors in its hugely successful Affiliate program. Photo Caption: Pictured L-R: Derek Snyder, GC Pro Regional Manager; and 424 POST principals and co-founders Kami Asgar and Sean McCormack. Asgar and McCormack have been relying on GC Pro for gear and unparalleled service since their company's inception.